I have been using Singapore Math (SM) with my 5-yr old for a couple of months and thought I'd share a little bit about why I chose it and my initial impressions. SM was developed in 1982 by a Singaporean government-appointed team. 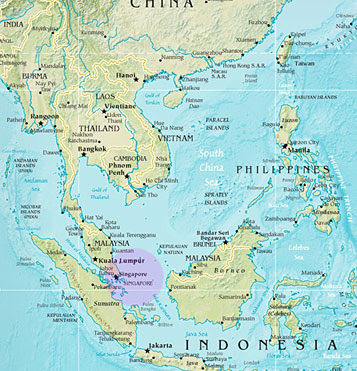 In case you've never heard of Singapore, it is a small island, city-state just south of Malaysia. It is a country of mixed peoples (there are four official languages!) known for their innovation, efficiency, and yes, math scores! There are two versions available for use in the US, the US version and the Standards version. From what I could gather through the information available on the Singaporemath.com website, the US version is the "original" SM but made for use in the US. (Sections for US standards of measurement, US English instead of British, etc.) The Standards version includes all the same information as the US version, but with added concepts and an earlier introduction of various concepts. I read through all the information available through Singaporemath.com as well as several different forum posts to determine which version would suit our needs. As with anything, people on both sides of the fence are very passionate about their side. Some people like the added difficulty of the Standards Edition and some say that more is not necessarily better. What I surmised was that, aside from price, there wasn't much difference in the early grades (through 2nd). The Standards version is considerably more expensive than the US version, so, I decided to allow frugality to reign over my decision for now and went with the US version. We will probably make the switch to the Standards version once we reach the 3rd grade level. For more information on specific differences, click here to see a comparison chart on the Singapore Math website. For each grade level, except Kindergarten, there are two textbooks and two workbooks (ex. 1A, 1B and 2A, 2B). For Kindergarten the workbook and textbooks are combined (except in the Standards Version). There are also teaching guides, extra practice workbooks, testing materials, and manipulatives available for purchase to go along with each grade level. I like to keep things simple, so I only ordered the textbook and workbook. I ended up starting my son on level 2A, since he is already strong in math. If you're unsure of which level your child should start with, there are free placement tests available on the SM website. I love the many different ways the text teaches the same concept. For example, in the beginning there is a lesson to review addition without renaming. The concept is shown by combining two groups of objects to create a larger group. Next it is demonstrated in a chart with columns for hundreds, tens, and ones places. Then there is an example with bundles of tens and ones pencils being combined. Finally there are vertical, horizontal, mental, and story practice problems. The workbook then uses a combination of puzzles, word problems, games, and exercises to practice the concepts. I enjoy the bright colorful pictures; my son and I both find them engaging. I like the way the information is organized in the textbook so that there is not an overwhelming amount of information on each page. It is simple, logical, and easy to follow. 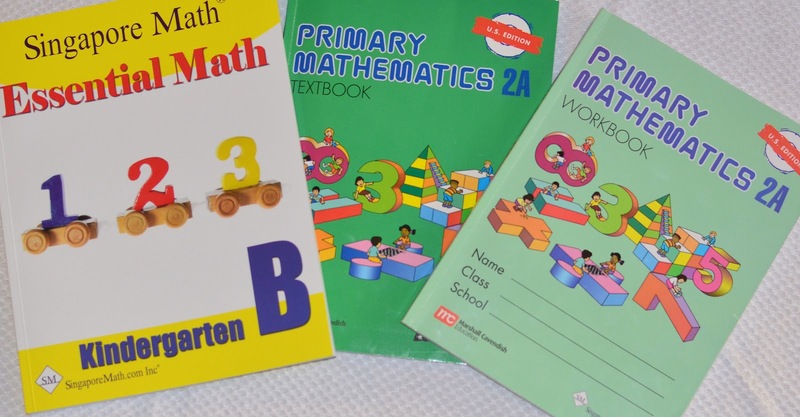 If you are interested in purchasing Singapore Math, you can order it from the SM website or I found several of the books for sale on ebay in new condition. I did go ahead and order the Kindergarten B ($10) book to eventually start with my 3-yr old, but I am not nearly as impressed with the Kindergarten text as the rest of the primary math. The US edition Kindergarten book is not in color, and for the price, I feel you'd be money ahead getting an early math workbook at the Dollar Store or Target Dollar Section. I did look through the sample pages of the Standards Edition which can be found on the SM website, and both the textbook and workbook (remember the Kindergarten Standards Version has a textbook and workbook) are in color. These might be more engaging for a little learner, but are also much more expensive, $23 for the text and $15 for the workbook. I have been using this workbook with my 3-yr old and love it! I believe I got it at Joann's with one of their coupons, but I've also seen it available on Amazon. I love that it is stickers, so my son doesn't have to be able to write to complete the exercises. The Primary Math series (US edition) is excellent and in my opinion is better than the Standards edition The Standards edition crams some topics that are in 6th grade in the Primary Math series into the 5th grade. They did this to squeeze in topics on data/statistics to comply with the California math standards. I used the Primary Math series with my daughter and her friend and had good results. Nice pics. Thanks for sharing such kinds of international Preschool Singapore Blog. Thanks. !! !